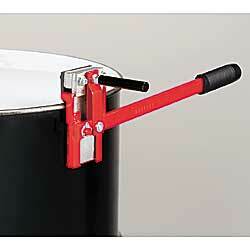 Quickly and easily opens any size and gauge steel drum. Sharp-edged hardened steel blade and comfortable plastic hand grip. IN STOCK. YP-1150 Wt. 8 lbs. Vertical Slide Drum Deheader. YP-1151 Wt. 1 lb. Replacement Blade.